You may want to consider getting a safe to the touch kettle if you are using it regularly and are worried about hands getting scolded by the hot surface. Cool touch kettles are an excellent investment if you have young kids who love to touch everything in sight, or you are worried about accidentally burning yourself if you are working in the kitchen and move the kettle after it has boiled. They are also great for individuals who have mobility issues and prefer to hold an appliance with two hands when pouring rather than using the handle. Some great options have a cool outer wall, so we have rounded up seven of the best kettles that can help to keep your family safe from burns. 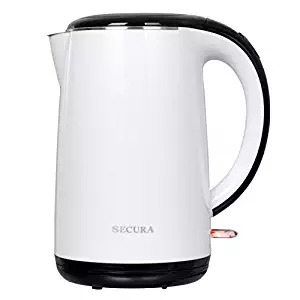 The Secura 1.8 Quart Stainless Steel Electric Water Kettle is a great option if you are looking for a kettle that will boil water quickly, while the outside doesn’t get hot, even when it just finished heating. The double wall not only keeps everything cold on the outside, but it also helps to keeps the boiled water hot for longer. This model is all stainless steel with no interior plastic parts, so there is no viewing port to check the level of the water. It has the standard warming unit that you plug into the wall on which the kettle sits. It also has the British Strix control inside, which is a thermostat that switches the power off as soon as it has boiled. It comes with a two-year warranty if you run into any issues. The one downside to this kettle is the lid doesn’t open all the way which in certain situations may make it difficult to fill. The Brevo Double Wall Cordless Electric Glass Kettle is another model that heats the water quickly, while still staying cool to the touch on the outer wall of the appliance. This design has a plastic outer wall with a premium-tempered borosilicate glass inner wall. The plastic outer wall is designed to stop collisions or accidents that can happen when a glass container comes in contact with another hard surface or container and then shatters causing a potentially dangerous spill. When the Brevo is turned on, a ring of blue light displays at the bottom, so you always know when the kettle is running. The glass interior means that it is easy to clean. There is food-grade glue at the bottom of the inner glass wall to help prevent leaks no plastic, but the rest of the interior has no plastic that comes in contact with the heated water, and it is BPA free. 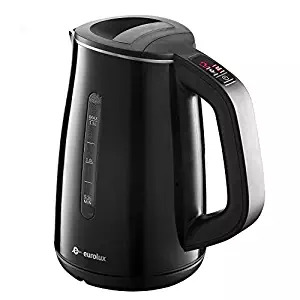 This model is a 1.7 Liter capacity, and still manages to heat up quickly and has an auto-shutoff feature once the water has reached boiling temperature. 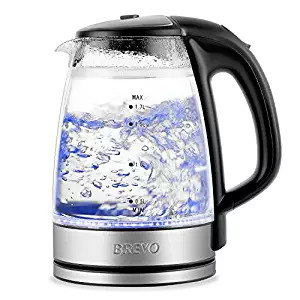 If you like this style but would prefer a kettle with an adjustable temperature option, Brevo also makes a cool touch Double Wall Variable Temperature Electric Glass Kettle. 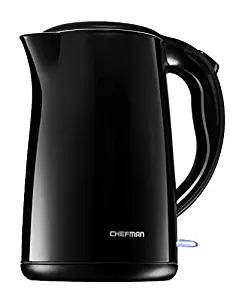 The Chefman Cool Touch Electric Kettle is a double wall model, with the inner wall being stainless steel while the outside wall and lid are plastic. A lot of people like the sleek, black design of the Chefman, which fits into most kitchen decors. The inside is easy to clean, and there is no seam on the interior, so you shouldn’t have any issues with leaking. It is also lightweight and is very quiet when it is boiling. It has the standard auto shut off, and the capacity is 1.8 quarts or 1.7 liters. The Aicok Electric Kettle Double Wall Cool Touch is also an excellent option for a quick boil, large capacity kettle. No plastic parts touch the water, and all of the inner parts are made of food grade stainless steel. It has a small base that doesn’t take up much counter space, and the design is quite sleek. Since it is a cool touch, the exterior doesn’t get hot when water is heating up, and the double wall helps to insulate the water, keeping it warm for longer. It comes with the British Strix control safety feature that means it will shut off automatically when it reaches the boiling point. It also comes with a 2-year warranty. 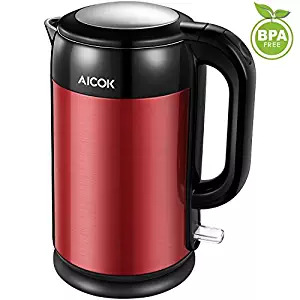 Aicok has just released a cool touch temperature control kettle that allows you to adjust the temperature if you want a bit more precision with the level you heat your water to when making different types of drinks. This newer design comes with an LED display that shows the temperature from 90℉-212℉. It is a little more expensive than the basic model, but it seems to be quite popular and good quality. The Eurolux Stainless steel, Cool Touch Electric Kettle is an inexpensive, 1.5-liter capacity model that has six adjustable pre-set temperature settings. It is a fantastic choice since most users find it to be good value, fast to heat up, and well made. Considering the price and the quality, it has a lot of great features including the adjustable temperature settings that allow choosing different temperatures for different drinks, and a keep warm button that will hold the heat for however long you would like. The temperature displays with a blinking LED light, which is a nice touch for a kettle in this price range. The interior is stainless steel. However, some users may not like that some water comes into contact with plastic because there is a water level viewer, although the plastic is BPA free. The design is modern and will fit in with most kitchen settings. The KitchenAid Pro Line electric kettle is a stylish and slightly more retro looking kettle than others on this list. It has a capacity of 1.5 liters and, like other cool touch models, it has the dual wall feature that not only keeps the kettle safe to touch it will also keep your water warm for longer. The lid has an easy open release button allowing it to open fully, so you shouldn’t have any trouble filling it. This model has a sliding temperature control option so you can adjust the level between 50 and 100 degrees Celsius if you are making different types of hot drinks. It comes with a five-year limited warranty. 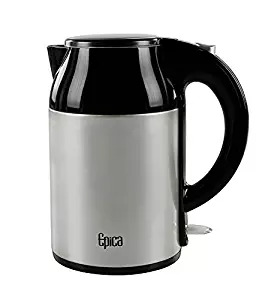 The Epica Top Rated Cordless Stainless Steel Electric Kettle is an inexpensive 1.7-liter capacity style, with the double-wall insulated cool-touch feature. It has a seamless (no leaks!) stainless steel interior, with only a small rectangular plastic pipe at the very top that doesn’t touch the water, just the steam within the interior. The outside is plastic, and overall it is very lightweight. It is reportedly easy to use and good quality for the price you are paying. Like most other electric styles it comes with the auto shut off, and you will know that the water has boiled when the light up switch turns off when it has reached the boiling point. It comes with a 2-year warranty. Double wall– If you aren’t sure if a kettle is cool touch, check to make sure that it has a double wall. A double wall is the most obvious indication that the device will be safe to touch after it has reached the boiling point. All of the cool touch kettles are made with a double wall. It allows the inner wall to heat up while the outer wall can stay cool to the touch. Often the inner wall is stainless steel, and the outer wall is plastic. The inner wall could also be glass. Plastic on the interior – Many people are concerned with the consequences of heating water touching plastic. If this is an issue for you, make sure you look for designs that have interiors of food grade stainless steel or glass, Often the kettle may say stainless steel interior, but there will be some plastic parts ( parts of a filter, the lid, the thermostat for the auto shutoff, or the viewing port). Generally, if there is plastic in the inside, it doesn’t usually come into contact with the water and is almost always BPA free. If you are looking for an electric kettle design that has no plastic, be sure to read the reviews very carefully because the descriptions of the products can be misleading. Leaking– One problem that can occur with an electric kettle is leaking. Leaking can be an annoying issue that won’t stop once it has started. To prevent leaks some manufacturers use a food-grade glue if it is a glass model, or they may use a continuous bowl of stainless steel that doesn’t have any seams. Weight – If you have difficulty lifting heavy items you may want to look for a lightweight kettle. Everyone will want something comfortable to lift and pour. The heaviness of an empty kettle can vary quite a bit, but for the most part, electric styles are relatively lightweight. Boil Time – The great thing about all of the products on our list above is that they all have a quick boil time. The more water you add the longer it will take, but the double walled models do heat up very quickly. Auto shut-off– One of the best features of electric kettles is that they have an auto shut off. There is very little chance or water boiling dry unless the product has a defect. This means that you can turn the kettle on and go and do other stuff without worrying about forgetting that it is running. 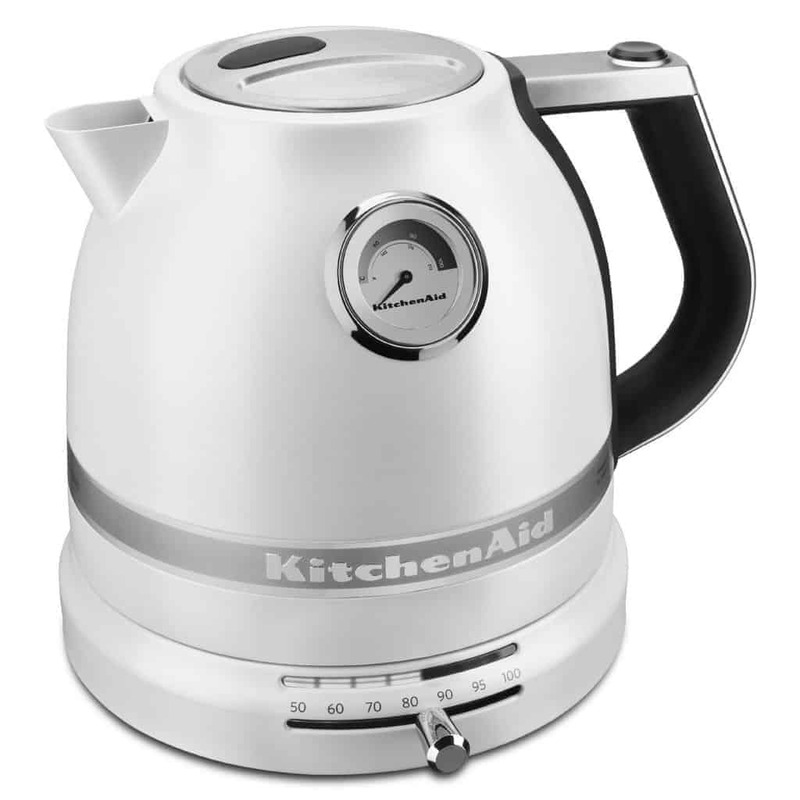 Design-If you are new to using an electric kettle, the most common design is often referred to as cordless. It means that the kettle sits on the base that you plug into the wall. When the water has boiled you lift it off the base and pour. Capacity – Most of the double walled models have a capacity from 1.5- 1.7-Liters. Variable Temperature Settings– If you make different types of tea or coffee that need a precise temperature level and not just the boiling point, you will probably want to look for the variable temperature setting feature. You will pay a little more for this feature, but it lets you find the ideal brewing temperature for various coffees and teas. Keep Warm Button – Some of the models that we listed have a keep warm button, which is especially useful if you are using the adjustable temperature setting. This feature allows you to keep the temperature at a particular level for half an hour or longer.